With no jade mines or known quarries in the province, you may be surprised to learn that people used jade in Alberta thousands of years ago. Jade is a common name that refers to two minerals, one of which, nephrite, is found in Canada. Close-up photograph of a jade (‘nephrite’) artifact from northwest Alberta (by Todd Kristensen). Nephrite is one of the toughest natural materials on earth and for this reason, ancient people used it to make tools called celts. Tightly interlocking bundles of amphibole crystals (actinolite/tremolite) make nephrite incredibly resistant to fracture so the celts retain their sharp edges despite hours of wood-working with them. 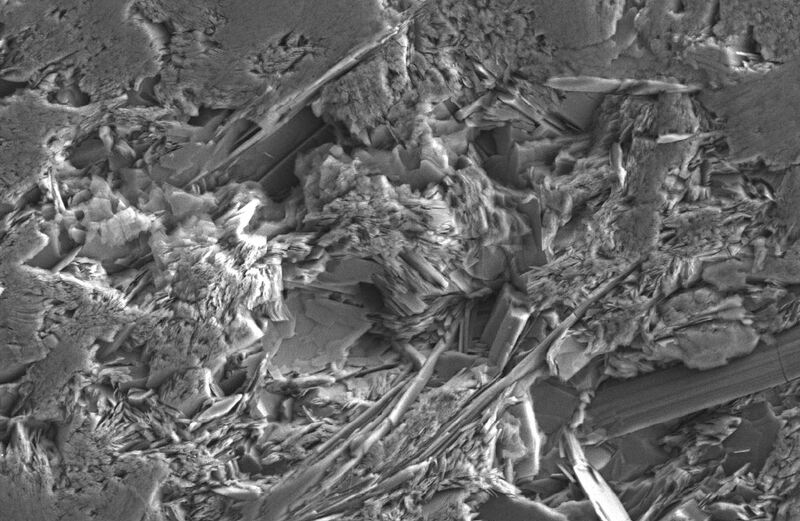 Tightly interlocking bundles visible in this Scanning Electron Microscope image give jade (‘nephrite’) its strength (courtesy of Jesse Morin). How did people make jade or nephrite celts? Slowly! As in modern times, nephrite was too strong to chip with a chisel so it was patiently sawed and ground with materials like sandstone and quartz crystals and polished with a slurry of gritty water. 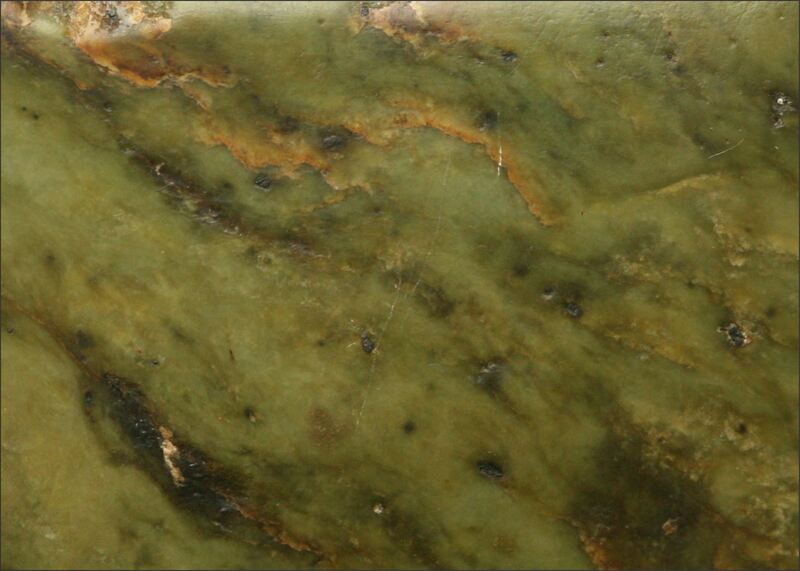 Jade occurs in outcrops across British Columbia where some First Nations had specialized jade workers. Most of the evidence for Aboriginal nephrite working comes from the Fraser River of southern B.C. near Lytton, Lillooet, and Hope. While the celts manufactured by pre-contact people were certainly functional, the rarity of jade and the time it took to make celts would have resulted in a highly revered and prized type of tool. Nephrite celts are highly polished with a flat and slab-like shape. This specimen was found near Stony Plain outside of Edmonton (by Todd Kristensen). Nephrite celts have been recovered from several farmers’ fields across Alberta but have never been found during an archaeological excavation in the province. They are generally more common in northern Alberta where First Nations likely maintained stronger trading connections to people from B.C. than in the south. 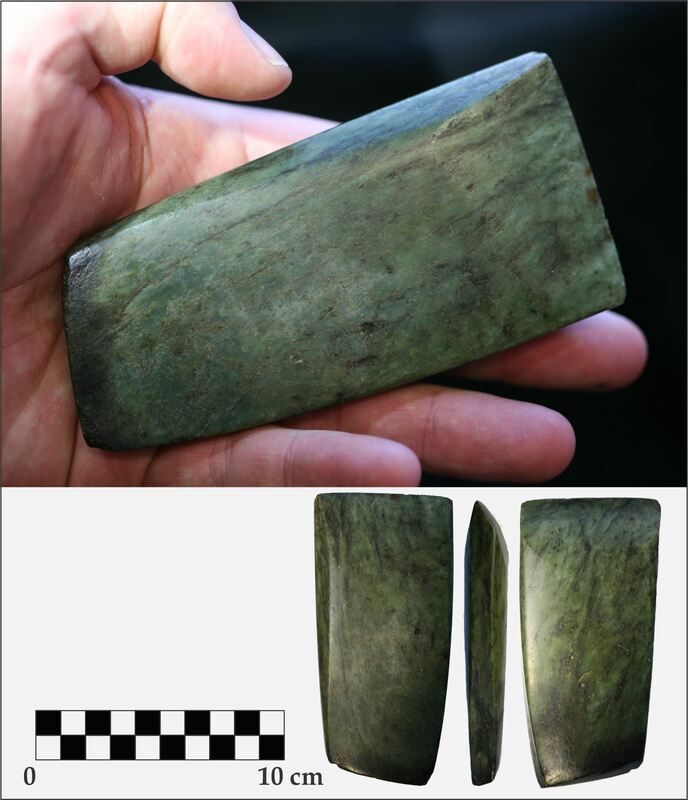 Jade or nephrite celts found in Alberta. Specimens 1, 2, 3, 5, and 8 are from the Grande Prairie area. Specimens 4, 6, and 7 are from the Edmonton area. 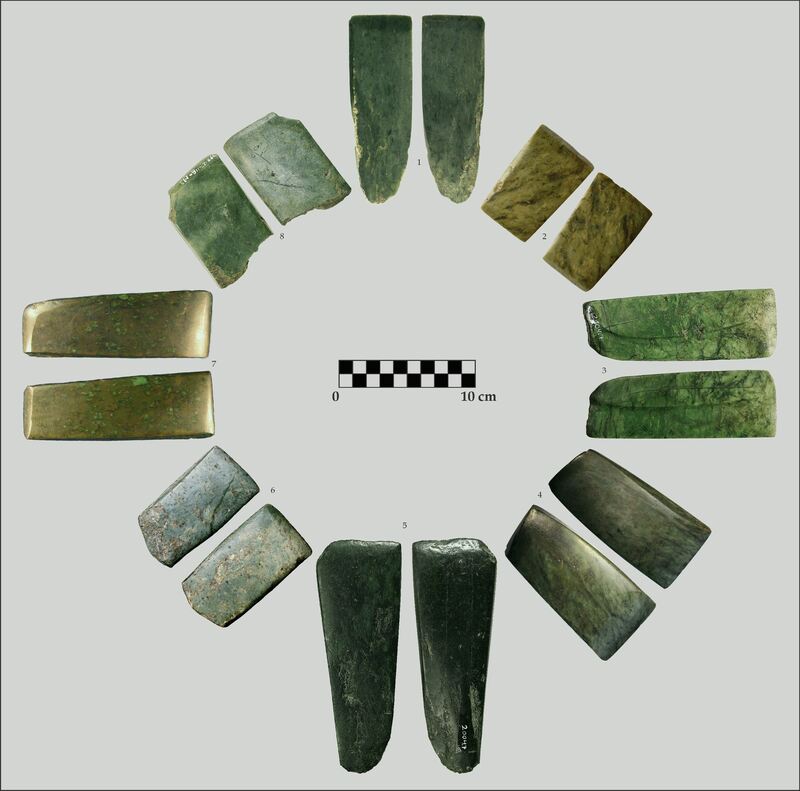 Based on historic records and tools used by First Nations shortly after European contact, jade celts were most likely tied onto wood or antler handles to increase the force that people could apply to the tool. The Alberta celts are thought to have been either ceremonial, status-markers, and/or they were used to build boats or prepare wooden poles. 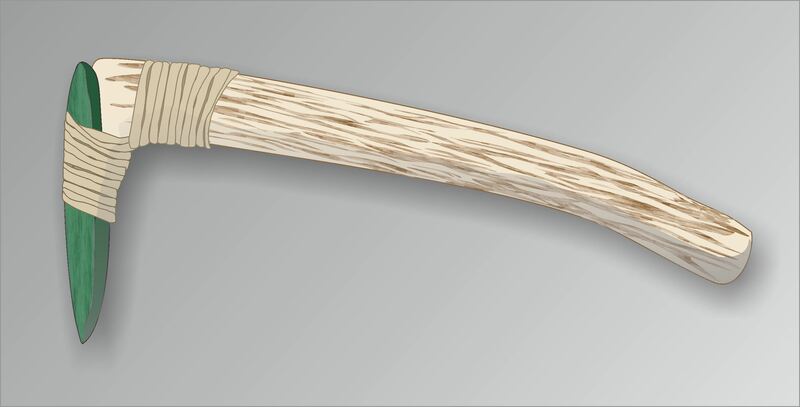 A large spur on the end of a wood or antler handle served as a platform on which to tie or ‘haft’ a flat celt (by Todd Kristensen). Staff from the Archaeological Survey, Royal Alberta Museum, and University of Alberta collaborated with museums and farmers across Alberta to analyse our rare jade artifacts. Jade expert Jesse Morin from B.C. analysed specimens and lent his knowledge to the project. Full results, including geochemistry, mineralogy, and archaeological significance of Alberta’s jade will appear in an Occasional Paper Series article that will be available to the public shortly. Thanks to all the researchers for their help and thanks to the museums and farmers for kindly loaning artifacts for this study! The historic downtown of Fort Macleod, one of two Provincial Historic Areas in the province, is well known for its impressive commercial buildings of brick and sandstone masonry. Collectively, these Classical Revival buildings exemplify an Edwardian commercial streetscape just prior to the First World War. One of the main street’s crown jewels is the Empress Theatre, an elegant brick building with decorative sandstone details built in 1912. Historically a hub of the town’s social life, the theatre hosted plays, vaudeville acts and performers from Alberta, across North America and even overseas, as graffiti preserved in the original basement dressing rooms attests to this day. The original façade was theatrical in its own right and featured a grand arched entrance and recessed box office. As tastes changed and motion pictures grew in popularity, the original entry was enclosed to provide a lobby and concession, the auditorium was renovated with plush upholstered seats in the Art Deco style and neon tulips mounted on the ceiling, and a bold new neon sign and marquee replaced the original blade sign on the front facade. These 1930s and 1950s renovations added layers of architectural history and significance to the building and contributed to its designation as a Provincial Historic Resource in 1982. The Empress Theatre in April 2016 (top). Bottom from left: View west along 24 Street in 1953, Glenbow Archives photograph NA-5600-6653 (cropped slightly from original); detail of 1953 streetscape showing the Empress marquee in essentially its present form; historic colours exposed on a blade sign letter; a plywood mock-up to evaluate proposed blade sign colours. From August 8-12th, 2016, Todd Kristensen (Northern Archaeologist), Robin Woywitka (Cultural Land Use Analyst), Courtney Lakevold (Archaeological Information Coordinator) and graduate student Timothy Allan visited Willmore Wilderness Park as part of the Rocky Mountain Alpine Project (RMAP). RMAP is focused on the recovery of archaeological artifacts and other organic remains (e.g., feathers, bones, caribou antlers and dung) from melting ice patches. Amazing artifacts have been found melting out of ice patches in alpine areas in the Yukon, Northwest Territories, United States and Norway. These finds have been very important for understanding how people used alpine areas in the past. When people think of archaeology in Alberta they might picture buffalo jumps, rock art, or medicine wheels. These are dramatic types of sites on the prairies but what about the north? Alberta’s boreal forest has a unique record and requires a unique breed of archaeologist to find it. This blog is a small window to archaeological work in the northern half of the province and some of the interesting archaeological sites hiding in our forests. Archaeologists working in northern Alberta brave bugs, blowdown (piles of fallen trees stacked like a cruel game of KerPlunk) and a range of conditions from blistering hot to bitterly cold. Forests are quite good at concealing sites so archaeologists dig hundreds of small shovel tests to find them. Most archaeology in the ‘Green Zone’ (typically forested Crown Land) happens in advance of forestry, oil and gas activity, gravel operations, and construction of transmission or road corridors. The hard work and skill of consulting archaeologists has resulted in over 8000 archaeological sites in the Green Zone. 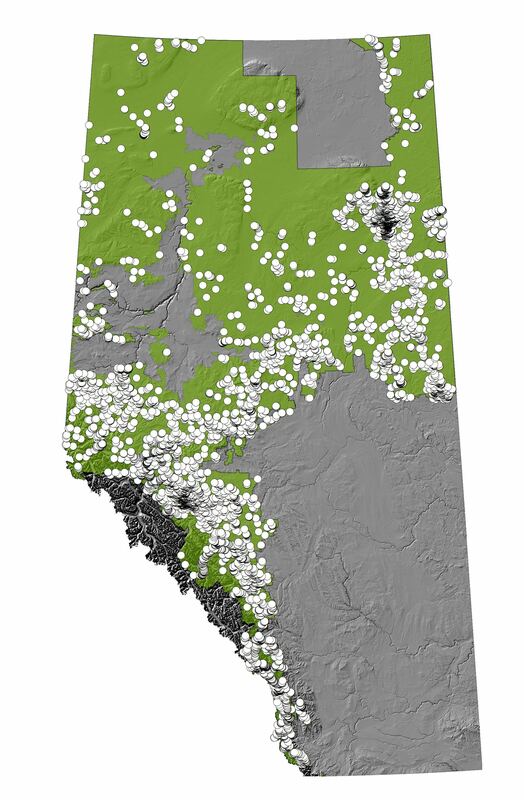 Roughly 8000 sites have been found in Alberta’s boreal forest (highlighted in green). Historic Archaeology at Edmonton’s Mill Creek Ravine – Volunteers Welcome! Have you ever wondered about archaeology in your own city? Have you ever wanted to be an archaeologist? This summer an archaeologist from the University of Chicago is leading an archaeological investigation in the Mill Creek Ravine! Haeden Stewart is looking for remains from historic settlements to learn more about daily life in the early 20th century, as the city was industrializing. In the early 1900’s, the Mill Creek Ravine was home to several mills, meat packing plants, a railway line, and homes of the ravine’s workers. Haeden will be excavating two locations this summer. The first is a shanty town located at the north end of the Mill Creek Ravine. This town was one of many that settlers built in the first few decades of the 20th century. Some shanty towns were more temporary, but some, like the Ross Acreage in Mill Creek, were more substantial and housed settlers for many years. Haeden’s team has already been working at the shanty town for several weeks, where they have unearthed some great finds, including animal bones, glass bottles, and the remains of two chickens buried in a pit! Toy saucer from a historic shanty town in the Mill Creek Ravine, Edmonton. Photo Credit: Haeden Stewart. Next, Haeden plans to excavate at Vogel’s meatpacking plant in the south end of the ravine. Vogel’s was one of three large meatpacking plants built by 1910 in the Mill Creek Ravine. Haeden will be excavating every day of the week, from approximately 830am-530pm, except for Tuesday. If anyone is interested in volunteering to help out with the excavation please contact Haeden at haedenstewart@uchicago.edu, or call\text him at 773-827-4004 to make arrangements.